This week seven children are participating in a Stanford research study in a somewhat unusual setting -- a hotel in Newark, outside San Francisco. 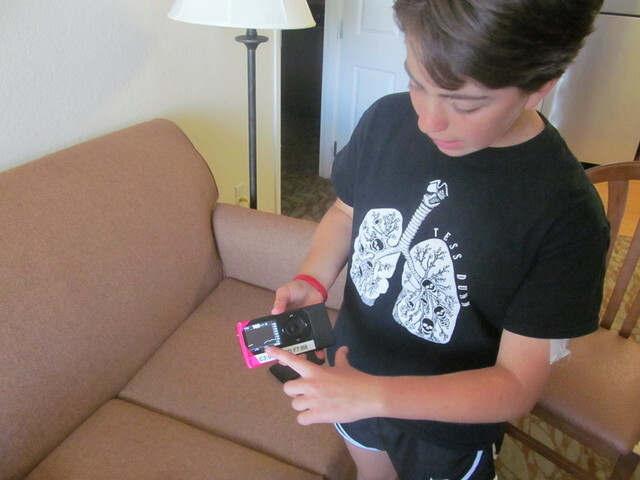 Researchers are testing an "artificial pancreas" on these children who all have Type 1 diabetes. The device is the latest advance in diabetes management technology. "We're trying to push this system to the limit by having the kids eat a lot and get out and run." The artificial pancreas is an android phone loaded with software mimicking the function of a real pancreas. Using bluetooth, the device communicates with two monitors attached to the patient's body; one that keeps track of blood sugar levels and another that pumps insulin into the body when those sugar levels are too high. It determines when and how much insulin to release and sends that information to the insulin pump without patient intervention. Researchers say the device could simplify the lives of those with diabetes by taking the guesswork out of treating the disease. Parents will often wake up multiple times each night to ensure their child's blood sugar levels are within the normal range and correct the problem if they aren't. The artificial pancreas could help eliminate those interruptions. "If you've been getting up in the middle of the night for years, it drains you," said Dr. Bruce Buckingham, a Stanford pediatric endocrinologist and head of the study. "You're brain-dead. And typically you're only getting three or so readings a night. This device takes a reading every 5 minutes, and adjusts the insulin by itself based on those readings." In the study the seven children, all under age 15, volunteered to spend four days and three nights in the Newark hotel to put the device to the test. Each day, the group eats meals at nearby restaurants and plays outside -- all while Stanford researchers monitor their blood sugar and insulin levels by accessing the device's readings online. They're trying to determine how well the artificial pancreas copes with the lifestyles of typical teenagers. "We're trying to push this system to the limit by having the kids eat a lot and get out and run," said Prof. Marc Breton, with the Center for Diabetes Technology at the University of Virginia. "We want to drive the system to the ground, so whatever errors that still exist are found today, as soon as possible." Tamar Sofer-Geri is the founder of CarbDM, a non-profit diabetes support group, Her daughter, Tia, is one of the children in the study. "Managing diabetes is a 24/7, 365 days a year full-time job where you get no vacations and no breaks," she said. "It's a huge job for anyone to take on, certainly a child. So any technology that makes that easier or takes any elements out of the equation is something we're interested in." So far, researchers say the results have been positive, and that's encouraging news to Sofer-Geri. "It would dramatically change the way she lives her life," said Sofer-Geri, referring to her daughter. "This would take so much of the decision making out of the equation. You're still wearing devices, but those devices are making the decisions for you." Buckingham plans to replicate the study at diabetes camps across the state this summer. Home trials are set to begin by the end of the year.